An increasing number of international initiatives aim to reconcile development with conservation. Crucial to successful implementation of these initiatives is a comprehensive understanding of the current ecological condition of landscapes and their spatial distributions. Here, we provide a cumulative measure of human modification of terrestrial lands based on modeling the physical extents of 13 anthropogenic stressors and their estimated impacts using spatially explicit global datasets with a median year of 2016. We quantified the degree of land modification and the amount and spatial configuration of low modified lands (i.e., natural areas relatively free from human alteration) across all ecoregions and biomes. 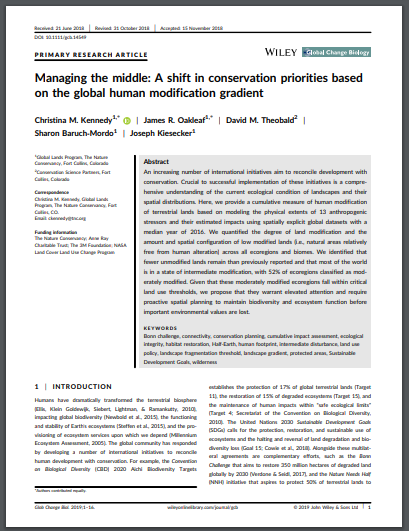 We identified that fewer unmodified lands remain than previously reported and that most of the world is in a state of intermediate modification, with 52% of ecoregions classified as moderately modified. Given that these moderately modified ecoregions fall within critical land use thresholds, we propose that they warrant elevated attention and require proactive spatial planning to maintain biodiversity and ecosystem function before important environmental values are lost.